What is really real as we shift into a new year? Only when we accept and fully embrace the reality that our lives and how we experience them are our creation, and ours alone, will we then be empowered to make the necessary changes. 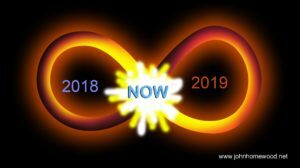 While 2018 fades into memory and 2019 is waited for in anticipation in our thoughts, the only thing that is ever really real experientially is the Present. And if we can’t find what we are looking for in the Present, (which is the only reality there is,) how can we find it in a mind-projected future? Think back to this time last year – you had hopes and even maybe anxieties for the year ahead. Now that year is past. All is gone. So much has changed. But what has not changed? What is still here? What never changes? What is permanent? What is real? Presence is pure Unconditioned Awareness through which all forms come and quickly go. While we are hypnotized by the passage of time and the ever changing movement of form, they are transient; always have been and always will be. And yet we seek permanence in that which is ever changing. And that incessant seeking is madness and creates disillusionment and our suffering in our awareness. At this time of the year it’s easy, (and ‘normal’) to get caught up in mental projections away from reality. But try something new – try focusing on that which is really real, that which is always here, that which never changes: the sacred Now, which is not what is occurring, not the objects of form, but the formless awareness that holds the ‘things’. Only by letting go of past and future and surrendering to the isness of life can we find what we are really looking for – peace, love, freedom and security. And then the only prayer we can possibly utter from that state of awareness is “THANK YOU”.